What a difference one person can make! 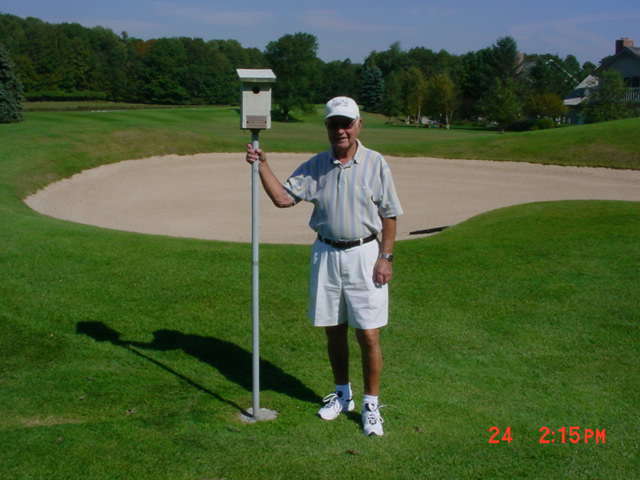 For 30 years, Robert Otto (pictured here) has been putting up nest boxes for bluebirds near his home in northern Michigan. A retired mechanical engineer, Robert has designed and built nest boxes that are easy to maintain and make it simple to check for eggs and fledglings. There are now 101 nest boxes on the golf course where he plays and in the back yards of friends. 2012 broke the record for the number of young bluebirds fledged from Robert’s boxes: 170, compared to 87 in 1980. What a difference one person can make! Robert Otto, who is 90, loves bluebirds. For 30 years he’s been putting up nest boxes for the birds near his home in northern Michigan. And not just your run-of-the-mill boxes either. Robert, a retired mechanical engineer, designed and built nesting boxes that are easy to maintain and to check for eggs and fledglings. He’s even put up the boxes at the 150-yard markers along the golf course where he plays. Robert and his team of volunteers monitor the boxes twice a week during nesting season, early April through August. There are now 101 nest boxes on the golf course and in the back yards of friends. Robert reports that chickadees sometimes use the boxes first but Eastern Bluebirds then build on top of the vacated chickadee nests. 2012 broke the record for the number of young bluebirds fledged: 170 up from 87 in 1980 with many double broods. What a difference one person can make. Today’s show is brought to you by the Bobolink Foundation. Do you know someone making life better for birds? A possible candidate for BirdNote show? Let us know at Birdnote.org. Bird sounds provided by The Macaulay Library of Natural Sounds at the Cornell Lab of Ornithology, Ithaca, New York. Songs and calls of Eastern Bluebird  and  recorded by W.L. Hershberger. Chatter of House Sparrows  recorded by W.W.H. Gunn. Use Robert Otto's plans to build your own bluebird nest box!